Hey! I've always just called this plant the alien finger plant because it grows in Y-shapes that look like knobby green fingers. Any ideas? It loves it's south-facing window and a little extra water here and there. Oh that is cute - Alien Fingers - love it! Both of these are still waiting to be identified, so if anyone recognizes any of these, please leave a comment! Just noticed my plant has tiny beads of sugar on hairs at leaf junctions. Yellow flowers in May. Growing very well. It is nicknamed the Fire sticks or Sticks on Fire, aka the pencil cactus or red pencil tree. In the winter the top parts of the stick will begin to brighten with color thus the term "fire stick". Its name is Euphorbia tirucalli. This also answer the question to "Unknown Plant" unfortunately not for "Pretty Succulent" that is a different plant probably of the same family. Please BE CAREFUL as the white sap that comes off the plant WILL BURN the skin severely. Always use gloves when repotting this plant. And if you have little ones or pets, it is also POISONOUS if ingested. It likes full sun, although mine preferred otherwise and does well inside. Prefers cactus mix soil, light water needs, and very little maintenance. Emma, very good point about the sap - I came across some very interesting information that pointed out the EXTREME danger of getting this on your skin or in your eyes. See the page Poisonous Succulent Plants for more. 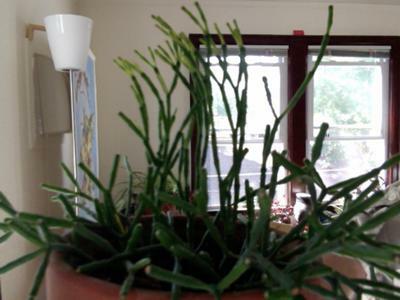 Alien Fingers, is called, rhipsalis capilliformis One common name is, "Old Mans Beard." One of the Rhipsalis, perhaps.